" This is how you shall eat it: your loins girded, your sandals on your feet, and your staff in your hand; and you shall eat it hurriedly. It is the passover of the Lord." Now, it is reasonable for one to assume that the Jews had their Passover meal from year to year, in the same manner as their forefathers had had before their flight out of Egypt , that is, standing up ! But we are made to believe, at least through images, that Jesus sat down with his disciples to have the Passover meal. My question is : Is there any denomiation which believes that Jesus had his Last Supper standing ? Scripture seems to indicate that Jesus and his disciples were reclined while eatig at the Last Supper. 14 And when the hour came, he reclined at table, and the apostles with him. 15 And he said to them, “I have earnestly desired to eat this Passover with you before I suffer. 16 For I tell you I will not eat it1 until it is fulfilled in the kingdom of God.” 17 And he took a cup, and when he had given thanks he said, “Take this, and divide it among yourselves. 18 For I tell you that from now on I will not drink of the fruit of the vine until the kingdom of God comes.” 19 And he took bread, and when he had given thanks, he broke it and gave it to them, saying, “This is my body, which is given for you. Do this in remembrance of me.” 20 And likewise the cup after they had eaten, saying, “This cup that is poured out for you is the new covenant in my blood.2 21 But behold, the hand of him who betrays me is with me on the table. 22 For the Son of Man goes pas it has been determined, but woe to that man by whom he is betrayed!” 23 And they began to question one another, which of them it could be who was going to do this. The ancients often reclined while eating their meals. Most of us sit around the meal table and even Leonardo Da Vinci's famous picture The Last Supper shows this. But the people of ancient times ate differently. Why Were They Reclining During the Last Supper? While reading John 13, it had me wondering why the word “reclining” was used during the last supper when Jesus talked about His upcoming betrayal. The same word appears in the books of Matthew (26:20), Mark (14:17), and Luke (22:14– “reclined”). During the ancient times, people (especially the Romans and the Greeks), ate while in a reclining position rather than sitting down. There may be a table in the middle and couches were set up around it. The above image is an example of how the Romans relined at mealtime in ancient Rome. Most of us who live now think of the Last Supper in terms that are familiar to us. In our imagination Jesus and his apostles sit around a square table on chairs. Jesus is a the center and his apostles arrayed around him. 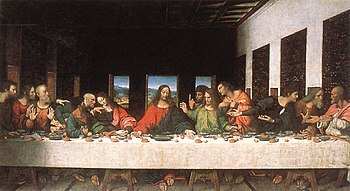 The famous painting of Leonardo Da Vinci is uppermost in most modern minds when thinking of the Last Supper. 1.Jesus and the Apostles did not sit on chairs at a table. Rather they reclined on ground or on mats and pillows, leaning on their left elbow (either forward of back) and eating with their right hand. Their legs were stretched out behind them. (See picture at left, click to get a bigger size) This was the typical fashion for eating in the ancient world. That they reclined to eat is made plain in the Gospel of Mark: While they were reclining at the table eating, he said, “I tell you the truth, one of you will betray me–one who is eating with me(Mk 14:18). It also explains some things that seem strange to us moderns. First of all why did John lean back on Jesus’ chest to ask him a question? (Jn 13:25; 21:20) This would be strange and physically awkward in a modern upright table setting. But reclining on one’s side on a mat meant you had to lean back to talk to the person next to you. There is also another strange scene where Jesus is reclining to eat in the home of a Pharisee and and a woman begins to anoint his feet (Luke 7:38). In a modern upright table setting this would mean she’s have to be under the table. Strange indeed! But in the ancient setting the posture was such that one’s feet were behind and thus the woman could approach Jesus from behind and begin to anoint his feet without his prior knowledge. 2.The Place of honor in modern western settings at a typical long rectangular table is either at the center or at one end. Everyone is seated upright and facing in to the center and can generally see all the others well. However, in the ancient meal setting the table was “U” shaped either as a half circle or with 90 degree arms. Instead of sitting at the center of the table (as in DaVinci’s painting above) the host or honored guest sat at the far left corner. Further, everyone sat on one side on the outside of the table allowing the inside of the table to open for servers. The picture to the right is from a very early mosaic in Ravenna, probably made well before the 5th Century. At this early time the artists still had access to the memory of the actual practices at the time of Jesus and thus depicts the Last Supper as it was more likely arranged. Notice that Jesus is at the head of the left corner and his disciples are arrayed in a sloping ark behind and sloping to his left. This was the usual setting for the ancient meal and especially something as formal as a passover meal. 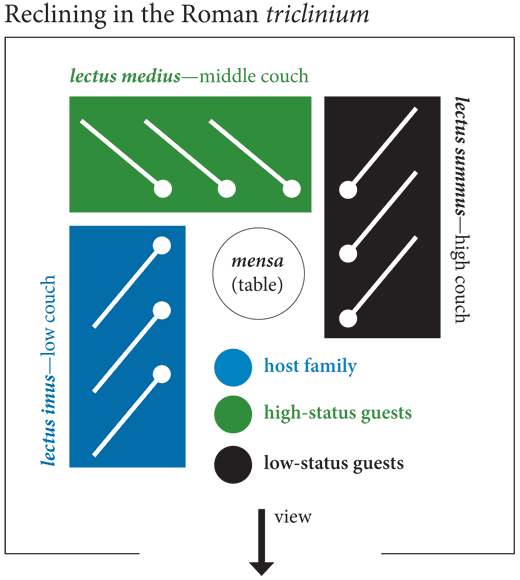 3.It would seem that the place of second honor was at the other end of the U shaped table on the right corner. This would help explain why Peter is not at Jesus’ immediate right or left and has to motion to John across the room to lean back and ask Jesus a question (Jn:13:24-25). Since Peter would like have had the other place of honor it makes sense that he would be across the room and unable to ask Jesus himself. Reclining at table seems to be the preferred interpretation as how Jesus and his disciples ate. Their seating places (reclining arrangements) are less sure. Not the answer you're looking for? Browse other questions tagged life-of-jesus tradition passover jewish-culture or ask your own question. Why did Jesus refer to Gentiles as dogs? Was the wine in The Last Supper fermented?